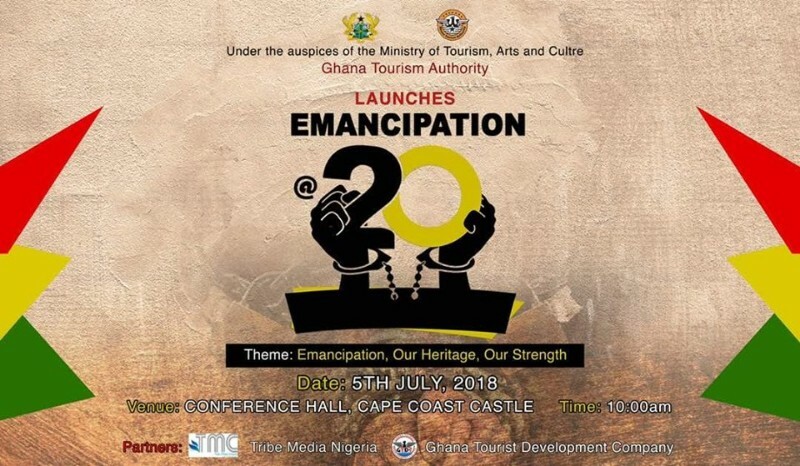 Emancipation Celebration is an annual event in Ghana, the Black Star of Africa and the gateway to the Homeland of people of African descent in the Diaspora. Emancipation was originally celebrated in the Caribbean to commemorate the final abolition of Chatel Slavery in the British colonies on 1st August 1834. Ghana became the first African nation to join in the celebration in 1998 to re-affirm its status as the Gateway to the African Homeland of Diasporans. Ghana’s claim to the position of the gateway to the Homeland is well grounded in the fact that it was a major exit point for slaves on the West Coast in the period that the infamous trade took place. Over 40 Forts & Castles built along Ghana’s coast which were used as trading centres for trading especially the Slave trade. Three of these castles; St. George’s Castle and St. Jago fort, both at Elmina, and Cape Coast Castle, designated by UNESCO as World Heritage sites. As a complement to these Forts and Castles, we are developing the Slave Route Project, which seeks to rehabilitate, restore and promote the tangible and intangible heritage from the slave trade, is being implemented. This route takes the tourist through communities where resistance was put up against the slave raiders, like Gwollu and Nalerigu with their defensive walls; slave market sites like Saakpili and Salaga, the slave bathing rivers and slave burial grounds at Assin-Manso among others. Emancipation Celebrations usually begins with wreath-laying ceremonies at W.E.B. Du Bois Centre, George Padmore Library and Kwame Nkrumah Memorial Park in memory of their contributions to the emancipation of Africans (blacks). Durbars are also held at major centres along the slave route i.e. Assin Praso and Assin Manso to create an opportunity for diasporans to interact with the communities. The main theme under which Emancipation is held is “Emancipation, Our Heritage, Our Strength”. At Assin Praso, participants partake in the River Crossing ceremony while at Assin Manso wreaths are laid on the tombs of returned remains of Diasporans from Jamaica. Other programmes lined up for the celebration include a Reverential night at the Cape Coast Castle.